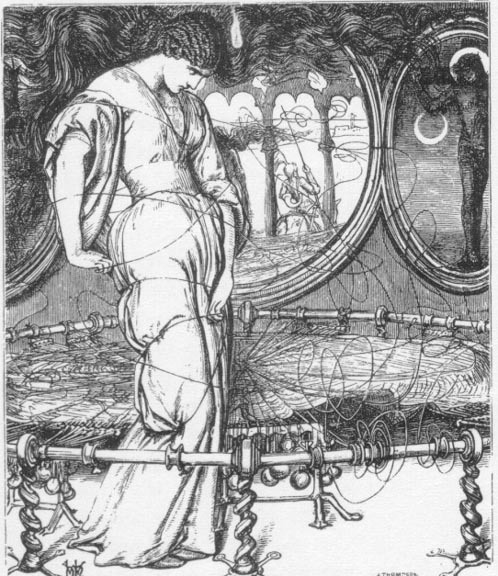 The Lady of Shalott, William Holman Hunt, 1857. From Poems by Alfred Tennyson, D.C.L., Poet Laureate. London, UK: E. Moxon, 1857. 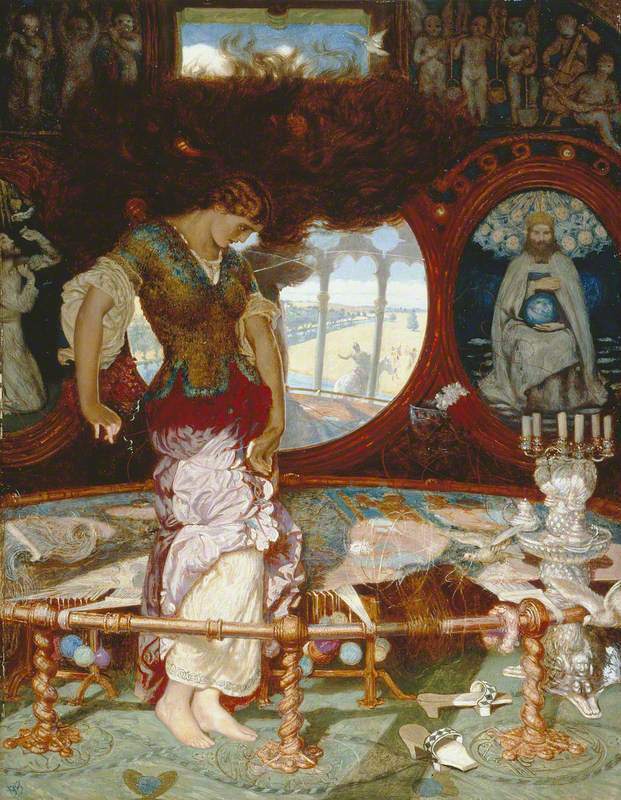 The Lady of Shalott, William Holman Hunt, c. 1886-1905. Nineteenth-century book production was a collaborative endeavor, and the end product was a multi-sensory art object. These intersections of collaboration and senses parallel the Pre-Raphaelite Brotherhood’s aesthetic and philosophical tenets. The collaborative aspect is linked to the formation of the Brotherhood, founded on a common dissatisfaction with contemporary art and a shared vision of what art could be. 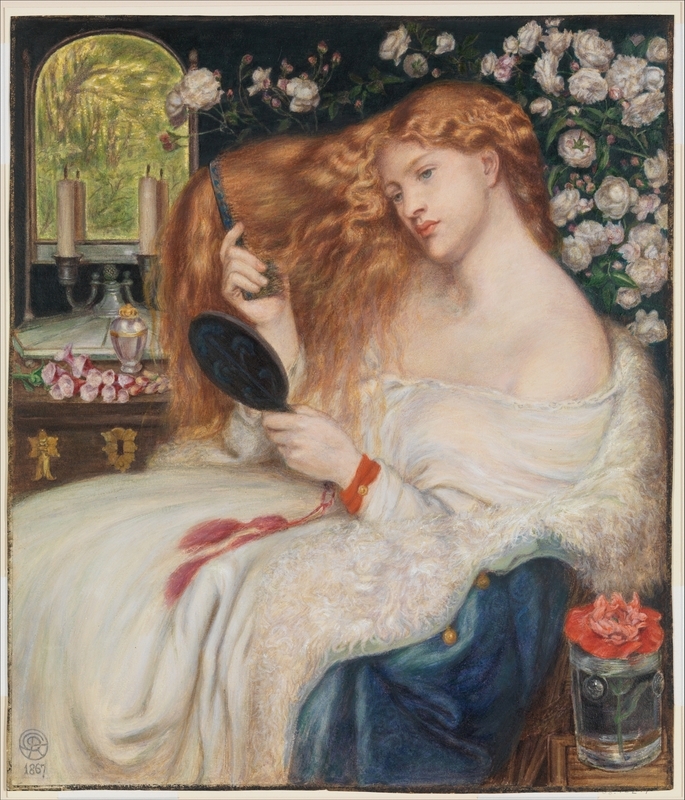 The Victorian sensorium connected senses to different mental and emotional faculties, and the Pre-Raphaelites believed their art had a similar power in addition to transcending the reality of the modern world. The combination—rather than isolation and denial—of the senses engaged through the book also parallels the integration and equality of media in Pre-Raphaelite books. Through an analysis of Victorian senses and embodiment, this exhibit establishes the book as a ‘container’ for Pre-Raphaelite artistic practice and, thus, as an access point to multiple arts (poetry, illustration, typography/typeface, and bindings). These elements qualify the book as an integrated art object itself. However, the reader's engagement with the book's visual and tactile elements places it in a distinct category between art and craft. The emotional intensity of Pre-Raphaelite art is best encapsulated on the printed page; the content works in conjunction with the form. In the context of this exhibition, the term ‘Pre-Raphaelite book’ refers to books with one or more elements created by members of the inner and outer Pre-Raphaelite circle. This exhibition analyzes the most comprehensive Pre-Raphaelite book, an 1857 publication of Alfred, Lord Tennyson (b. 1809 – d. 1892) poetry, simply titled Poems (known informally, and referred to from now on, as the Moxon Tennyson), and other books by the Pre-Raphaelites and their later associates from the University of Victoria’s Special Collections and Archives. This case study locates these books in relation to both the Victorian sensorium and Pre-Raphaelite artistic practice. 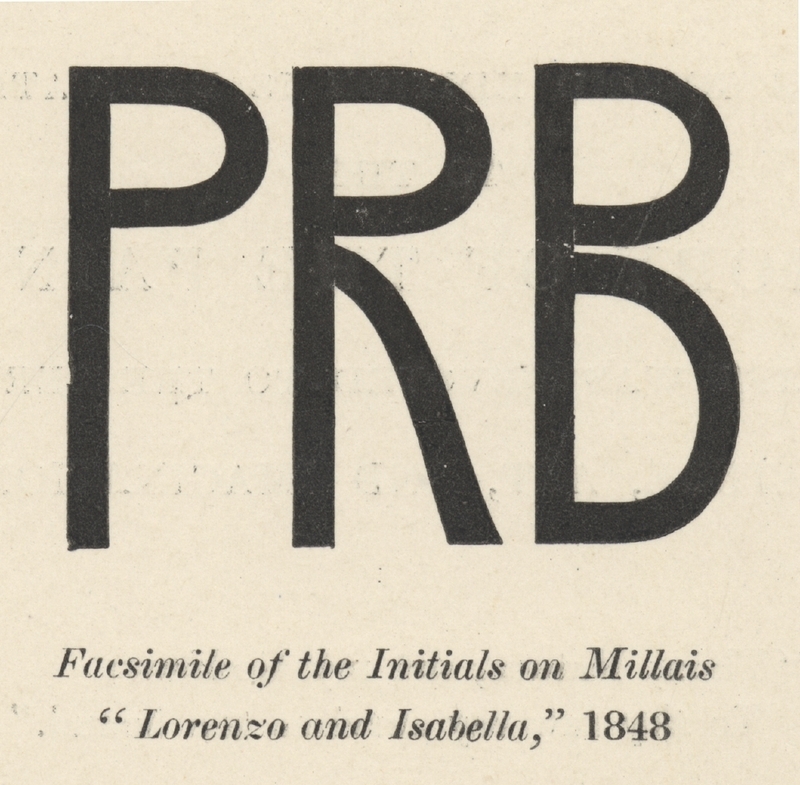 Facsimile of the initials on John Everette Millais' Lorenzo and Isabella (1848), published in William Holman Hunt, Pre-Raphaelitism and the Pre-Raphaelite Brotherhood, (London: MacMillan and Co. Ltd., 1905). 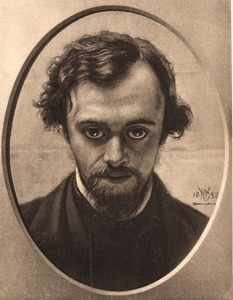 Dante Gabriel Rossetti Portrait by William Holman Hunt, 1853. 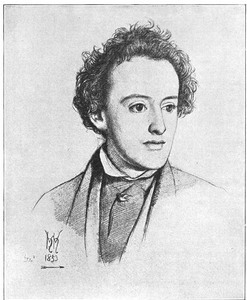 John Everett Millais Portrait by William Holman Hunt, 1853. 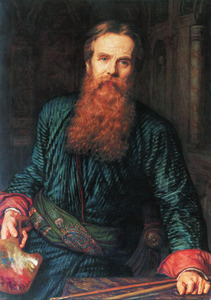 William Holman Hunt Self Portrait, 1867. Formed in 1848, the Pre-Raphaelite Brotherhood sought to revitalize British art. The desire for revitalization grew out of dissatisfaction with the Royal Academy, and, more broadly, the increasing industrialization and socio-political upheaval in Victorian Britain. Several members of the brotherhood worked concurrently in visual and literary arts, and the multifaceted nature of their artistic practice was particularly innovative when considered in its contemporary context. Generally, Victorians considered literature to be superior to painting in its ability to communicate a moral message. Additionally, Victorians were reluctant to incorporate illustrations into their publications, further limiting the relationship between text and image . This was initially due to the separate printing processes for text and image, but the reluctance continued even with the inception of wood engraving, which produced both in the same relief process . The hierarchy of art slowly shifted with mass publication—and consequently the mass dissemination—of text and images together in a codex format. The Pre-Raphaelites and their associates helped create this new environment for the institutions of both art and literature. The new environment of unified, multi-media production led painting and poetry to be deemed the ‘sister arts’ . This idea derived from the Horatian maxim, ut pictura poesis (“as a picture, also a poem”) which suggested that the two arts were linked, and simply acted as translations of one another in different media . The former artistic hierarchy was further challenged with the force of William Morris and the Arts & Crafts movement, which moved beyond text and images and asserted the artfulness of everyday objects, namely furnishings and other interior decors. These objects had both aesthetic and functional considerations and thus engaged senses that were limited when experiencing two-dimensional works. It is in this context of shifting art categories and sensory engagement that I situate Pre-Raphaelite book arts. Nineteenth-century book production saw its golden age in the 1860s, post-dating the official, seven-member Pre-Raphaelite Brotherhood’s disbandment in 1854, but aligning with their most prominent members and associates’ book art practices. 1. Richard Maxwell, ed., The Victorian Illustrated Book, (Charlottesville, VA: University of Virginia Press, 2002), xxii. 2. Colette Colligan and Margaret Linley, Media, Technology and Literature in the Nineteenth Century, (Burlington, VT: Ashgate, 2011), 108. 3. Lorraine Janzen Kooistra, Poetry, Pictures, and Popular Publishing: The Illustrated Gift Book and Victorian Visual Culture 1855-1875 (Athens, OH: Ohio University Press, 2011), 40. "Lady Lilith" by Dante Gabriel Rossetti, 1867. The early Pre-Raphaelites attempted to revitalize subject painting, a genre that emphasizes narrative. The literary subjects visualized by the Pre-Raphaelites ranged from biblical scripture to Tennyson poetry (i.e. the Moxon Tennyson), and this choice of subject suggests the importance and integration of literature early on . This was part of the wider revitalization of British art, as subject painting had been dismissed as artificial at the time . The Pre-Raphaelite belief that each picture should tell a story was an important step for the unification of text and image. This philosophy continued with William Morris’ Kelmscott Press (established in 1891) in which each book gave text and image equal status . In addition to this explicit relationship between narrative and art, Pre-Raphaelite paintings function similarly to books in subtler ways. For example, Dante Gabriel Rossetti’s "Lady Lilith." This painting makes direct reference to Jewish literature (Lilith was Adam’s first wife), and the extensive, detailed decoration flattens the plane of the image. This flat decoration is better suited to a printed page in codex form, and, as Lorraine Janzen Kooistra notes about this type of design, the patterned repetition is geared towards typographic elements found in the book . The Pre-Raphaelite aesthetic visualization of literature better suits book illustration than canvas painting, and in this way, books encapsulate Pre-Raphaelite art better than other media. To gain a better understanding of the dynamic nature of this Pre-Raphaelite container, it is important to investigate Victorian conceptions of the book. This investigation relates back to the sensorium and the art category to which the book belongs. 1. Lorraine Janzen Kooistra, Poetry, Pictures, and Popular Publishing: The Illustrated Gift Book and Victorian Visual Culture 1855-1875 (Athens, OH: Ohio University Press, 2011), 41. 2. Dennis Welland, The Pre-Raphaelites in Literature and Art (London, UK: George G. Harrap & Co. Ltd., 1953), 13. 3. Samuel D. Albert, "'My Work is the Embodiment of Dreams': Morris, Burne-Jones, and Pre-Raphaelite Influences on Book Design," in Pocket Cathedrals: Pre-Raphaelite Book Illustration, ed. Susan Casteras (New Haven, CT: Yale Centre for British Art, 1991), 98. 4. Kooistra, Popular Publishing, 42.